For Memorial Day Weekend we hit the road -- well, air. 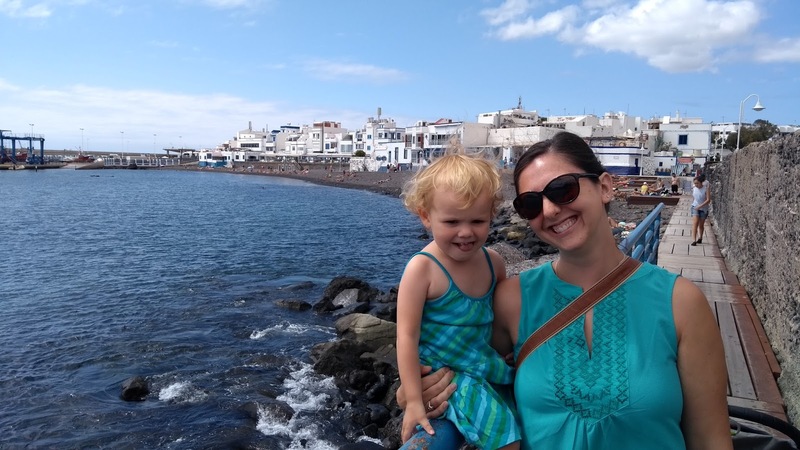 We went to the Canary Islands (specifically the island of Gran Canaria) with two other families and it was an absolute blast! It was insanely kid friendly and relaxing and fun and, well, such an awesome trip! First, as usaual -- a little information on the Canary Islands. The Canaries are a group of islands off the coast of southern Morocco (about a two hour flight from Sevilla). There are four main islands that the majority of tourists visit. Each offers something a little different.... we chose Gran Canaria because it had the cheapest flights that worked for us! Trevor and I have taken to calling the Canaries -- Spanish Hawaii -- there were SO many similarities it was crazy -- volcanic islands, the weather, the resorts, the beaches..... And since the Canaries are a hot spot for many Germans and norther Europeans, we heard and spoke English way more than Spanish! Each island has a lot to offer -- Gran Canaria had tons of options for activities: adventure, relaxing, cities, small towns and more! We stayed at the Gloria Palace San Agustin and it was amazing! It was such a family friendly resort and I cannot recommend it enough. They have family rooms (two bedrooms, one bathroom) but we stayed in one their regular hotel rooms. They had a pack n play for Serafina (but of course she didn't sleep in it) and even had a little bath kit for her -- shampoo, lotion, baby cologne (yes, that is a thing in Spain) and an adorable little bear sponge. There were kids and families everywhere! There was a kids club (for kids 4 and older), good kid-friendly choices at the breakfast buffet, a great kids pool and tons of space to run around and play (even some arcade games). While the resort is all inclusive, we just went with breakfast included (and the food wasn't bad). They had various activities for the older kids and adults throughout the day and a show each night. My only complaint was lack of parking for our rental car! We went into this trip with very little plans as we wanted to see what the resort was like and what we all wanted to do before scheduling each day.... And well, we loved the resort and spent much more time there than originally planned! 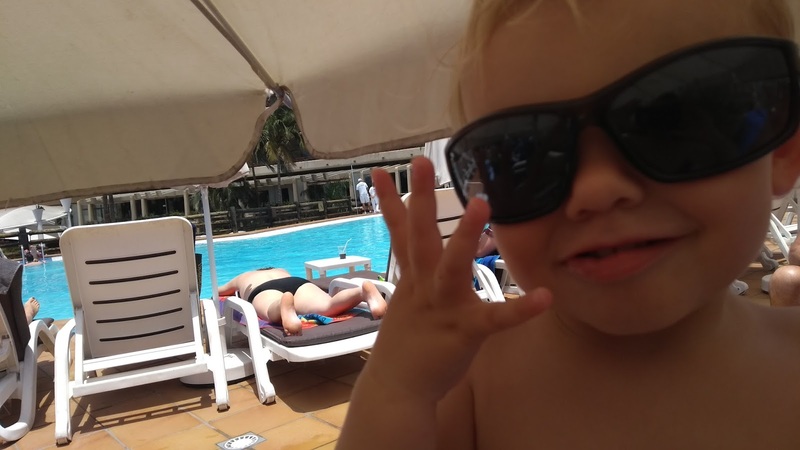 Our days were pretty relaxed with late wake ups, big huge breakfasts and then hitting the pool -- which our little water baby just loved. Every single morning the first words out of her mouth was "go water, go swimming....." closely followed by "go see Wyatt" (one of the boys in another family we came with). She'd play in the water until she got too cold, then relax on the lounge chairs, then stand on the pool deck and order everyone around (throwing pool toys to all the boys!) and repeat -- I think it is safe to say, our Peanut had an absolute blast! so most Spanish girls (until usually 7-9 years old), only wear bottoms -- we apparently embrace this as well! On one afternoon, we tore our baby girl away from the water and went exploring. 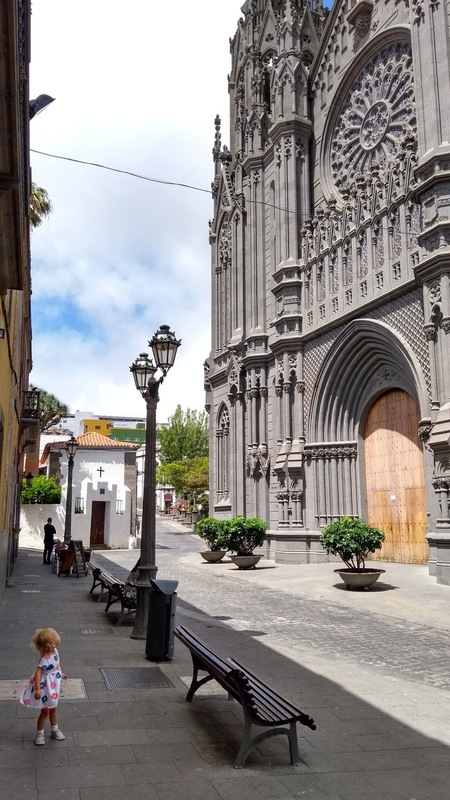 We drove up the coast through Las Palmas (the biggest city) and onto a small port town -- Puerto de las Nieves which we loved. We wish we had brought our bathing suits -- gorgeous black rock beaches, great places to jump into the water and natural swimming pools (and most importantly to the Peanut -- a good ice cream shop)! Then we continued our adventures into the mountains and went to Teror -- a very cool town with wonderful architecture (specifically the wooden balconies on the main street). Sadly, we weren't really dressed for mountain weather and were quite cold... and it was a Saturday afternoon so everything was closed, but we had heard great things about the town so we'd love to see it again! And we also went on a hike -- which was gorgeous and breathtaking and totally worth the awful drive and sprained ankle (I'll get to that, promise). 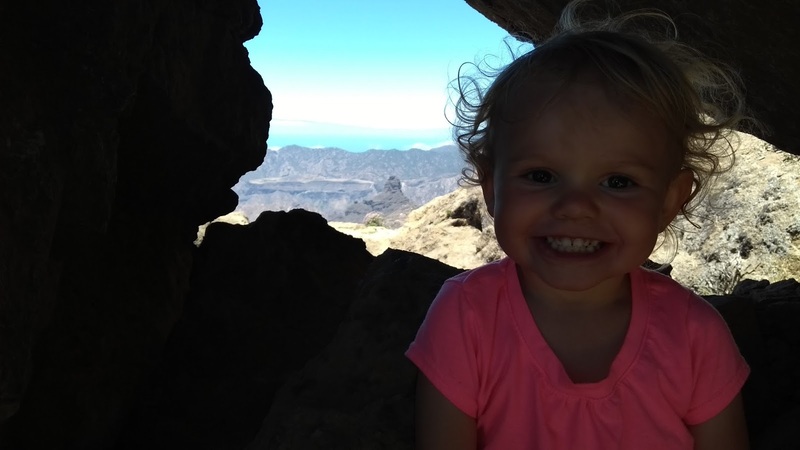 So Gran Canaria is known for some pretty amazing hiking trails so we had a lot of options to choose from... however, we needed to find one that wasn't too hard or too long and kid friendly. We went with Roque Nublo -- a really big rock (it is thought to be one of the largest natural crag in the world). The trail is 3 kilometers round trip and worked well for the kids (the younger ones had to be carried at times, but they all did great). I will warn you that the drive is awful -- over an hour of crazy switch backs and narrow road. But -- Serafina loved hiking and wanted to walk the whole thing! I finally put her on my back in the Tula, but she continued to demand where we went yelling at me "go dis way" or "over there momma" -- she loved every minute of it! And the views from the top were just spectacular. It was a perfect and we could see for miles -- almost a 360 view of the island and we were even able to see another island (Tenerife). Then on the way back down (it was a little steep at parts), I slipped when wearing a sleeping Peanut on my back and went down hard. Thankfully she was okay but my ankle was not. Adrenaline and a lift from Trevor and our friends helped me down the mountain (and thankfully it ended up just being a sprain and I am on the mend)! Sadly, our lovely weekend away came to an end. We spent our last morning hanging at the pool well past check out time (the hotel was wonderful: they held our bags and let us shower at the spa), then we made our way to another cute little town -- Arucas. Again we came during an "off" time (a holiday for the islands) but the church was gorgeous (even the Peanut was in awe), there was a really fun park at the end of the walking street and we bought some local rum (that was so so tasty). We had such a wonderful weekend away and would love to get back to the islands, especially exploring a different one! First, the island is FULL of various activities for kids: activity parks, water parks, theme parks, zoo/aquarium, beaches, museums (Columbus stopped here on his way to America) and more! We had every intention of going to some of these places, but our resort was just too much fun for us to venture out too much! Second, food -- the majority of the food was not Spanish (at all! ); the whole area catered much more to the northern European and British crowd. We typically had a super big breakfast, so lunch was light and often at the resort then dinners out. We ate at Il Vespino Vecchio the first night and while the food was lovely, it wasn't the most kid friendly place, even if they were extremely nice. We ate at Greek Taverna and it was wonderful! We can't get Greek food easily here so it was amazing and they were simply wonderful with all the kids -- even had a play table with coloring and games for the kids and even brought our Peanut a plate full cucumbers! We also ate at a fun Italian place in Puerto de Mogan -- the port was rows after rows of restaurants and shops by the beach. While a little touristy for us, it was still fun and the food was good (and again, super kid friendly)!